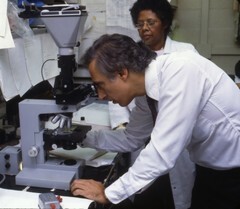 Robert Charles Gallo, former Biomedical Researcher. He is best known for his work with the Human Immunodeficiency Virus (HIV), the infectious agent responsible for the Acquired Immune Deficiency Syndrome (AIDS). He was the former Chief of Laboratory of Tumor Cell Biology at the National Institutes of Health.